From the mountains of fur to the rivers of slobber, everything about Goliath, Gunther and Gasket is supersized. 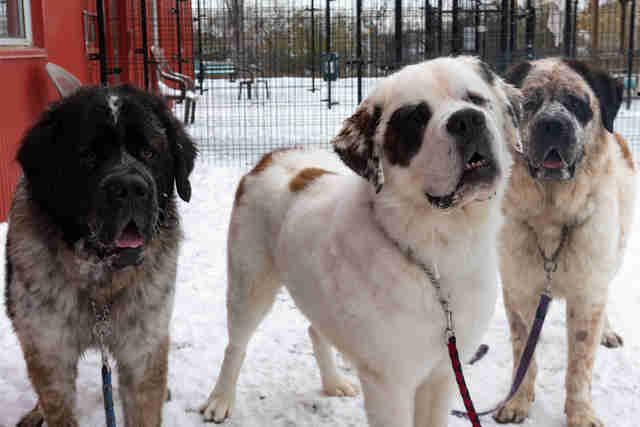 The three dogs are so big that a unique arrangement had to be made to accommodate them at the shelter. 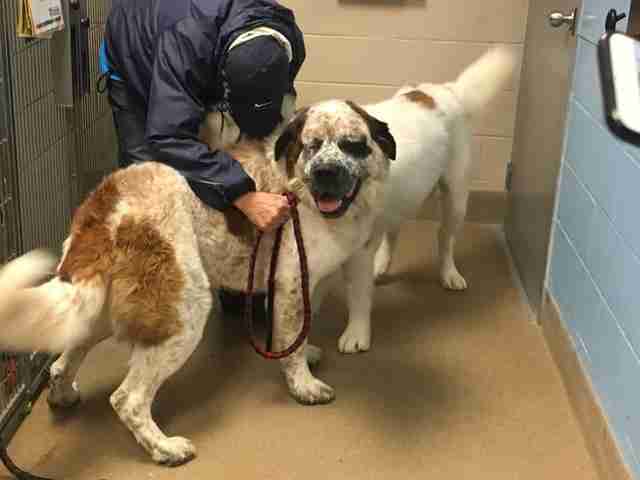 “We had to close one of our entire dog wards down so they have adequate space to stay together,” Jamey Blair, manager of animal health and protection for the shelter, told The Dodo. Shelter workers had a hunch that the 5-year-old homeless littermates had a special bond. They’d been doing everything together since birth, including eating from the same bowl, so staffers conducted a specialized behavior assessment soon after they arrived. This meant separating the pups for just a little while, to see how they would react. The anxiety the dogs felt when they were apart proved to the shelter workers that they had to go to the same home — which Blair knew would take a very special adopter. 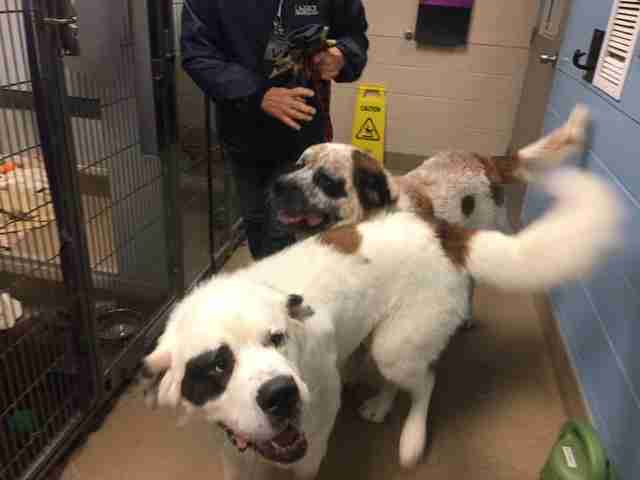 In order to find the perfect match for the bonded pups, the shelter shared their story on Facebook, and to the staff’s surprise, the response was just as big as the dogs themselves. The team is now carefully sorting through interested adopters, making sure they take their time to find a great match for the trio. While having triple the dogs does mean heightened expenses, it also means triple the love. And Blair is hoping that with the power of social media, these dogs will find a forever family very soon. 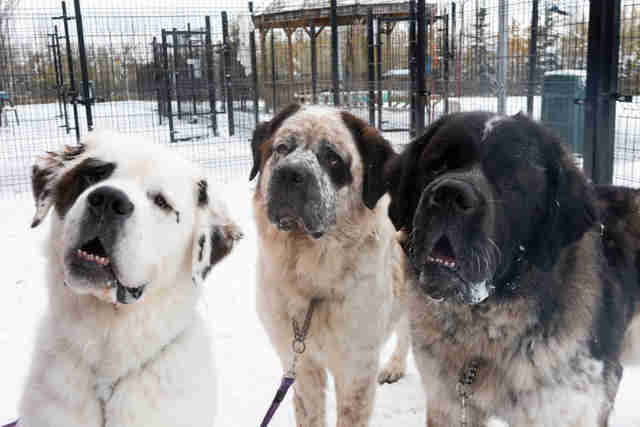 If you live in the Edmonton, Canada, area and are interested in adopting Goliath, Gunther and Gasket, you can send an email to the Edmonton Humane Society. For those living outside of Canada, check your local shelter for other pups in need of a home.